Angel broking is one of the largest full service broker in India. Lets have a detailed review of Angel Broking Brokerage Charges & Angel Broking Brokerage Plans. This section deals in depth about the Angel broking brokerage charges that an investor would incur while undertaking trading with Angel Broking. Herein, not only the basic Angel Broking charges are discussed, but also the additional statutory charges that are levied for any transaction. This has been done to ensure that the readers get a wholesome picture and are well informed about the total outflow they may suffer and plan their activities accordingly. We hope that by the end of this article, the readers will have adequate knowledge of the various applicable charges and are in a position to self-assess the total charges payable. The very first charge is in form of brokerage charge – this is kind of a cut paid to the broking firm for facilitating the trading. The previous basic brokerage charges prescribed by Angel Broking has been revoked. Now only flat rates of Rs 15 and Rs 30 is applicable , with effect from April 2019. To encourage trading in all the segments, Angel Broking is also providing higher exposure or limits to the traders than before. Angel Broking has come up with flat rate plans called as Angel i-Trade Plan with Rs.15 flat brokerage per order for order size upto Rs.50000 and only Rs.30 flat brokerage per order for order size above Rs.50000. 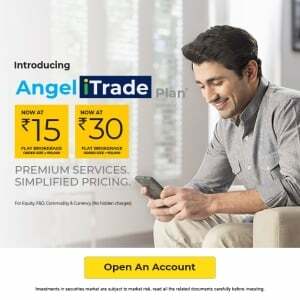 Angel iTrade Plan is applicable for all segments from April 2019 onwards. If you have any query then you can clear your doubts by connecting to Angel Broking Representative immediately and avail the offer. This is the most expensive brokerage plan for both delivery & intraday trading. This is the 2nd most expensive brokerage plan of Angel Broking. Angel Broking charges as low as 0.28% & 0.02% brokerage for Delivery & Intraday respectively. This is one of the most recommended Brokerage plan as it doesn’t charge very high Margin money & also, lowers the brokerage rate quite a bit. Angel Premier plan subscription comes at INR 50,000-99,999. This is the most loved brokerage plan by Angel broking clients as it lowers the Angel broking brokerage charges significantly. The brokerage charge for this plan is 0.18 & 0.02 for Delivery & Intraday respectively. The brokerage charges for this angel broking plan is 0.13% & 0.01% for Delivery & Intraday trading respectively. SEBI Turnover – INR 15 per Cr. The above details would suffice for an investor to learn about the total charges that he or she has to bear for any trading activity. Transaction charges : This includes two components – Exchange turnover charges and clearing charges. The exchange turnover charges are the charges levied by the stock exchange for providing a platform to execute trade. The clearing charges are the charges that are paid or incurred by the stock broker to get the trade settled/cleared either by professional clearing member or by itself. STT ( Securities transaction tax): This is a fiscal tax imposed by the Government. This was introduced to curb cases where the profits from trading were not being declared by the investors. SEBI Turnover fee: This came in effect in January 2007 and was introduced by SEBI – Securities & Exchange Board of India. SEBI prescribed that the brokerage houses are required to pay certain percent of their respective turnover. The brokerage houses charge their investor with this fee (i.e. the prescribed percentage is charged on the value of transaction) on each transaction and then remit this to the SEBI via concerned stock exchange. This fee is shown separately in the contract note.